This Thai beef salad is named after the famous grilled beef dish in Thailand, "Weeping Tiger Beef". There are various stories to back up the name, one that the chilies in the sauce made a tiger weep; the other is that a tiger cried when a hunter killed and took away his cow. 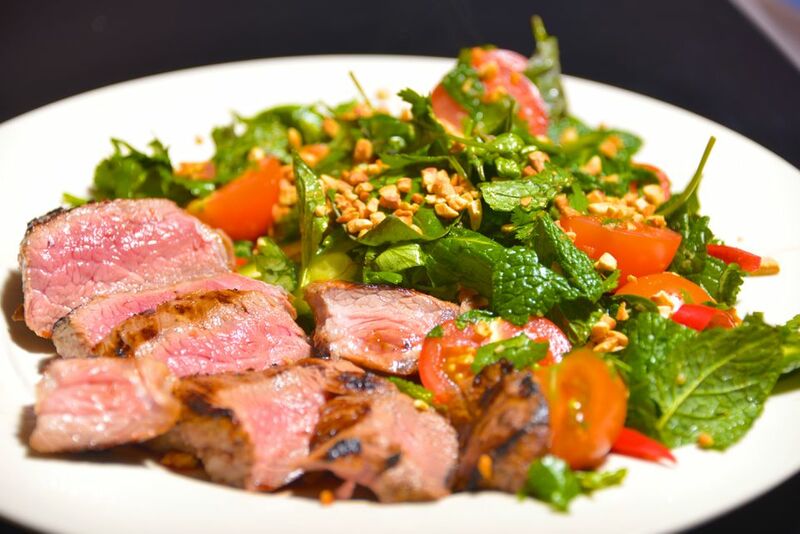 The recipe calls for sirloin or your favorite cut of beef which is marinated and then quickly grilled and served over salad greens with tomatoes and fresh herbs. It is then tossed with a flavor-popping Thai dressing for a delicious Thai treat that's perfect for a summer dinner or special lunch. Stir marinade ingredients together in a cup and spoon over steaks, turning them to ensure all sides are saturated. Set in the refrigerator to marinate at least 20 minutes or up to 4 hours. Stir dressing ingredients together in a cup, adjusting the fish sauce according to your desired level of saltiness. It should taste tangy with a balance of sweet and sour, spicy and salty. Place greens in a large salad bowl and add the onion, tomato, coriander , and mint. Set aside. Warm up your grill and lightly brush with vegetable oil. Grill steaks until cooked on the outside and slightly red on the inside (in Thailand this steak is served quite rare on the inside). Any leftover marinade can be brushed on after the first turning. Slice steak thinly and place over the salad along with 3/4 of the peanuts. Drizzle dressing over and toss. Portion out into bowls or individual plates and add a final topping of chopped peanuts and coriander. This dish can also be served with rice instead of salad, which is the traditional way. If you decide to serve it with rice, use the dressing as a side sauce to be spooned over the meat before eating (see Weeping Tiger Beef Recipe). The meat is served anywhere from medium-rare to rare, so feel free to grill according to your liking.